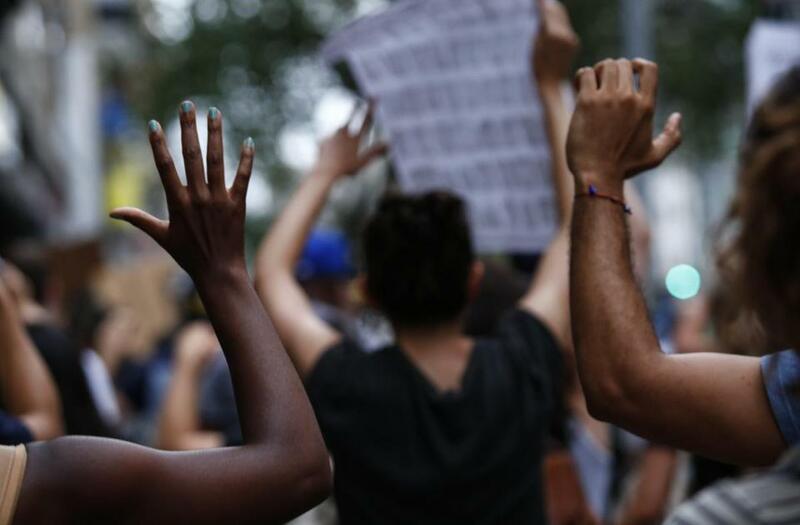 People took part in a protest in New York City. The Black Lives Matter movement isn’t backing down, despite concerns about a backlash after the killings of five police officers by a black sniper in Dallas. Organizers quickly repudiated violence against police, but also said they understand the frustration that led to Thursday’s shootings. ‘‘He said he was upset about the recent police shootings. The suspect said he was upset at white people. The suspect stated that he wanted to kill white people, especially white officers,’’ the chief said. Police have not indicated whether the shooter had any involvement with Black Lives Matter, but the killings have put the movement under a microscope. ‘‘This is a devastating time for us as activists and organizers. We cannot bring about justice through violence,’’ said Jeff Hood, a pastor in Dallas who said he heard the shots and saw officers fall after Thursday night’s rally. The youthful organizers seem determined to keep up their pressure with angry marches, waving off criticism from some that they bear responsibility for the killings. Many others — including such civil rights icons as U.S. Rep Congressman John Lewis — say the protests must remain peaceful to achieve justice. ‘‘I was beaten bloody by police officers. But I never hated them. I said, ‘Thank you for your service,’’’ Lewis tweeted Friday. That comment prompted scornful responses by some African-Americans, who seek a more combative approach despite the backlash. ‘‘Everyone is not going to be on our side, but those who understand will join in the struggle and help educate the masses. We are hurting. We are tired. We are fed up,’’ said Erica Mines of the Philly Coalition for REAL Justice. Black Lives Matter began in 2013 after black teenager Trayvon Martin was shot to death in Florida by one-time community watch volunteer George Zimmerman, who was later acquitted. The movement has grown as fatal shootings of blacks by police officers are increasingly recorded and shared on social media, sometimes as confrontations are still unfolding. After this week, are activists concerned about their safety? Of course, says Black Lives Matter Philly organizer Laniece Williams. A Texas organizer of Black Lives Matter, Ashton P. Woods, said the repeated shootings by police are pushing some unstable people over the edge. ‘‘We can’t really focus on whether people are going to cast us as a hate group when we are working to dismantle hate,’’ Woods said. Reeves reported from Birmingham, Alabama. Haines Whack contributed from Philadelphia.